As most boaters know, a beautiful day on the water doesn’t always stay that way. A few years ago, a group of friends joined me on my boat anticipating a relaxing day on the lake. We were all eager to try our luck fishing. As the mate stood by to cast off the lines, the bright morning sun was joined by a breeze coming in off the bay. An uneasy feeling came over me as I started the engines. I could see a heavy fog setting in. Within minutes, visibility went from unrestricted to almost nil. I dislike fog more than any other element encountered on the water. Not only is there a need to be alert regarding my position, but the need also arises to guard against boat operators who demonstrate little regard for poor visibility. My vessel had all the electronic equipment necessary to navigate and considering the possibility the fog might only be along the shoreline, we decided to continue preparations to get underway. Minutes after our departure from the dock, the fog became so thick we barely could see beyond the bow. I posted my mate and a couple of friends as lookouts as we cautiously made way. A few seconds later, the mate shouted, “Stop.” As I reversed engines to stop, a sailboat loomed out of the fog within a few feet dead ahead. It was anchored in the fairway (area for boats underway) with an obvious lack of concern for vessels transiting the harbor. Fog had completely blanketed the harbor and was so thick the breakwall had faded from sight. A return to the dock seemed a wise choice. We were hopeful the warm sun noted earlier would burn off the fog as fast as it had set in and if so, we would still get out fishing. A small boat pulled up as we set waiting at dockside. The operator asked what he could do about the sailboat in the middle of the harbor. He had fouled its anchor line and damaged his propeller. He stated he had not seen the boat until after he hit the line. If you plan to operate a boat on large bodies of water, be aware the Coast Guard has specific signaling requirements of vessels underway, at anchor or aground during periods of limited visibility. A prudent boat operator needs to know these signals, not only to sound himself but also to understand them when he hears another vessel sounding. 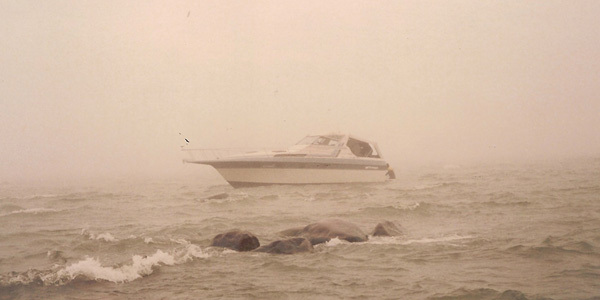 Attempting to navigate in fog, especially in unfamiliar waters, produces a feeling of extreme apprehension. The following are a few suggestions to help safely navigate during fog conditions. 1. Slow to a safe operating speed. Be prepared and able to stop in the distance of visibility. 2. Post lookouts. Instruct them to listen for other vessels. 3. If you think you are near other vessels, sound the proper signal or even a danger signal if you feel a boat is too close for safety. 4. Watch your depth indicator closely or use a lead line. Watch your compass to maintain a straight course. Use a loran, radar or any other electronics you may have to assist you. KEEP IN MIND, ELECTRONICS ONLY ASSIST YOU IN NAVIGATING AND ARE NOT FOOLPROOF. Using them should not replace the use of lookouts nor eliminate the need for reducing speed. 5. Be constantly aware other boaters may run fast and reckless during these conditions. 6. If you are unable to establish your position, stop, shut your engine down and listen. You may hear vehicular sounds from ashore, nearby boats or breakers on a reef, all of which may help you to determine your position. 7. Your best choice may be to anchor and wait out the fog. Strong winds are seldom present during fog conditions therefore your safety should not be jeopardized. 8. No boat of any size should venture out on a large body of water without radio communications. Use the radio calmly if lost in the fog. A nearby radio station on a vessel or land may be able to locate you with an RDF (radio direction finder) and assist you to safe moorage. To test your skills in anticipation of fog conditions, run a predicted log course. To do this, limit your visibility by covering your windshield, and obstructing your view as much as possible. Navigate from one known position to another by use of instruments only. Get a few vessels together and try this, it will help you gain confidence. If you spend time on the water undoubtedly you will find yourself in fog. Be prepared, stay calm. Although you may be delayed, you CAN get in safely.